Another successful Hunter Electric Vehicle Festival. Recharging NSW is always keen to support this event as it combines both advocacy (the festival) and STEM (the EV Prize) in one event. This year as well as having a stall, we also helped out our local public school in the mini EV Prize. The EV prize: where High school students are encouraged to design, construct and race a push bike converted to electric powered. The Mini EV Prize: this year Primary school students also had an opportunity to participate. Designing, constructing and racing, solar powered race cars (about the size of a remote control car). The Hunter Electric Vehicle Festival: had stalls showcasing local business electric transport and solar innovation. The Hunter Electric Vehicle Festival was a great way to meet other electric vehicle owners. The majority of the electric vehicles on display privately owned, as well as extras that came to visit. The festival gave owners an opportunity to meet each other as well as share real world stories of how amazing and easy electric vehicle ownership really is. We also met some Zero motorcycle owners who decided to perform a Kramer Experiment, visiting from Sydney. Coupled nicely with the Hunter Electric Vehicle Festival, Beyond Zero Emissions launched their electric vehicle report the Saturday night. With guest speakers from Hyundai, Tom Farrell Institute and Lake Macquarie city council. Our very own Kymberly joined them afterwards as a panellist, it soon became apparent that (based on the questions) the technology is not the issue. If we want electric vehicles to succeed we need to get more expert opinions from physiological and sociological fields of study. Nissan is celebrating 5 years of the LEAF and Tesla Australia is celebrating 1 year in Australia. With the upcoming New year I thought it would be good to look back at the history of electric vehicles in NSW. Lets look at growth in NSW Tesla don’t share their data with VFACTS, the industry body for new car sales reporting but RMS/RTA do keep registration statistics on how many cars of a particular brand are sold and what type of fuel they use. Using those statistics we can look at how many “pure electric” vehicles are on the road in NSW. The first production EV was the Mitsubishi i-MiEV launched in 2010 before then the 44 or so vehicles registered as electric with the RTA/RMS where most likely conversions. What’s included in this count? RMS count petrol/electrics separately so this count doesn’t include plug-in hybrids like the Outlander PHEV, Holden Volt or BMW i3 Rex. What it does include is listed below with their official release dates. 2009-2011 – 7.8 Registrations per quarter. 2012-2013 – 28.5 Registrations per quarter. 2014 Q1-Q3 – 5.3 Registrations per quarter. 2014 Q3-2015 Q3 – 66.5 Registrations per quarter. With the release of Tesla Model S we see Tesla alone contribute 52.5 Registrations per quarter, all other makes and models only managing 14 per quarter since 2014. The best performing quarter is the fourth quarter of 2014 with 87 registrations 65 Tesla 22 others. The worst performing quarter since the release of the i-MiEV first quarter of 2014 with only 4. Tesla has landed on our shores and has been welcomed with open arms with the fastest “selling” electric vehicle in NSW. Nissan/Mitsubishi was a steady seller until 2014. However Nissan have not released an updated model since 2012 in Australia, maybe it’s time for a new model LEAF that sell overseas. Mitsubishi also no longer have i-MiEV at dealerships, concentrating their efforts on the Outlander PHEV. In terms of charging standards we’ve seen Tesla enter with their own version of a type 2 socket which is Mennekes type 2 compatible. Where as everyone else has been type 1 J1772 it’s a bit hard to gauge a direction while 30% of pure electric vehicles are Tesla we don’t have accurate numbers for other type 1 J1772 plug-in vehicles like the Holden volt, Audi a3 e-tron Mitsubishi Outlander PHEV, BMW i3 REX, BMW i8 and the hybrid offerings from Porsche. Over the last year we’ve seen a significant growth in electric vehicles, installing a type 2 socket universal charging station to suit all vehicles at your office, shop, restaurant, church or sports field will further enhance the growth of electric vehicles. Please contact us to discuss further. We are on the road again this time come say hello at Goulburn connects the 15 November 2015, from 10a.m. to 4 p.m. at the GMC Recreation Area in Braidwood Road, Goulburn. 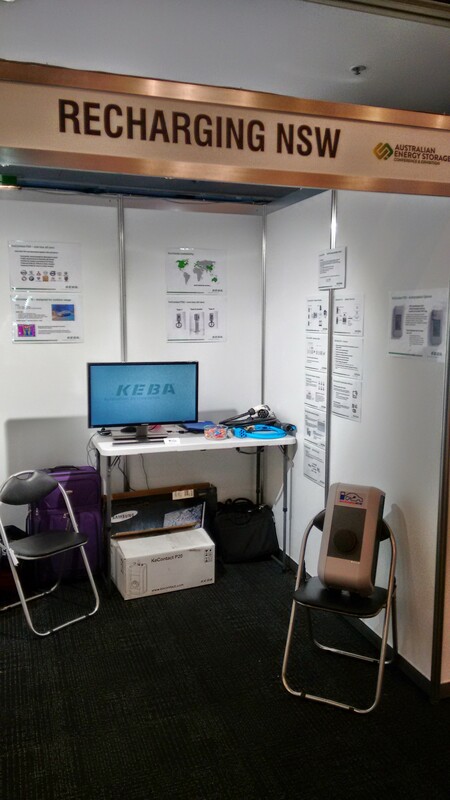 We’ll have our Keba P20 charging station on display and joining with Canberra EV to advocate the benefits of electric vehicles. For starters let me say this post is not all inclusive you should consult your local electrician or network supplier. I have put in some inquiries with network suppliers and will update accordingly. To know which rules apply to you you need to know who your network supplier is there are 3 in NSW, each supplier has separate rules but they are pretty similar. Service area is Sydney, Central Coast and Hunter. The terms and conditions for connections are stimulated in there network pricing Pages 32 to 36. I’ve summarised bellow. For those on time of use pricing your electricity is charged in 3 rates Peak (2pm to 8pm weekdays) , Shoulder (7am to 2pm and 8pm to 10pm weekdays or 7am to 10pm weekends) and Off Peak (10pm to 7am). Off peak generally is 10-12c/kwh, 1/6 the price of peak and 1/3 the price of shoulder to make use of these prices all you have to do is charge your car during these times. You can make it more convenient by using timers. Controlled loads are power circuits that are remotely controlled by Ausgrid. Ausgrid can choose to turn these circuits off to reduce demand on the network. A single installation can only have either controlled load 1 or 2 not both. You can connect any appliance to controlled provided it has fixed wiring basically no power points. In the case of EV charging the EVSE is the appliance not the car, so provided you have a hardwired EVSE you should be able to use controlled load. Also interesting point is that the document does have a cause for battery charging Section 10.3.2. Service area Sydney’s Greater West, the Southern Highlands and the Illawarra. The terms and conditions for connections are stimulated in there network pricing Pages 23 to 25. Controlled loads are power circuits that are remotely controlled by Endeavour. You can connect any appliance to controlled provided it has fixed wiring basically no power points except in the case of pool equipment. In the case of EV charging the EVSE is the appliance not the car so you can provide you have a hardwired EVSE. The rest of rural and regional NSW, Only document I can find is the pricing list, Off peak follows that of all the others above and controlled load has the same provisions of hardwired appliances only.